The Hajj season is upon us and I believe every Muslim should reflect upon this sermon at least once year. It signifies the completion of our faith and contains numerous lessons from which we can benefit. O people, just as you regard this month, this day, this city as sacred, so regard the life and property of every Muslim as a sacred trust. Return the goods entrusted to you to their rightful owners. Hurt no one so that no one may hurt you. Remember that you will indeed meet your Lord, and that He will indeed reckon your deeds. Allah has forbidden you to take interest; therefore, all interest obligations shall henceforth be waived. Your capital, however, is yours to keep. You will neither inflict nor suffer inequity. Allah has judged that there shall be no interest and that all interest due to al-`Abbas ibn `Abdul-Muttalib shall henceforth be waived. Every right arising out of homicide in pre-Islamic days is henceforth waived, and the first such right I waive is that arising from the murder of Rabi`ah ibn Al-Harith [a relative of the Prophet]. O mankind, the unbelievers indulge in tampering with the calendar in order to make permissible that which Allah forbade, and to forbid that which Allah has made permissible. With Allah the months are twelve; four of them are holy; three of these (holy months) are successive and one occurs singly between the months of Jumadah and Sha`ban. O people, it is true that you have certain rights with regard to your women, but they also have rights over you. If they abide by your right then to them belongs the right to be fed and clothed in kindness. Treat your women well and be kind to them, for they are your partners and committed helpers. And it is your right that they do not make friends with anyone of whom you do not approve, as well as never commit adultery. O people, listen to me in earnest. Worship Allah, say your five daily prayers, fast during the month of Ramadan, and give the share of Zakah in your wealth. Perform Hajj if you can afford to. All mankind is from Adam and Eve. An Arab has no superiority over a non-Arab, nor does a non-Arab have any superiority over an Arab; also a white has no superiority over a black, nor does a black have any superiority over a white except by piety and good action. Learn that every Muslim is the brother of another Muslim and that Muslims constitute one brotherhood. Nothing shall be legitimate to a Muslim that belongs to a fellow Muslim unless it was given freely and willingly. Do not, therefore, do injustice to yourselves. All those who listen to me shall pass on my words to others and those to others again; and may the last ones understand my words better than those who listen to me directly. Be my witness, O Allah, that I have conveyed Your message to Your people. The Sermon reiterates the basic belief in one God, establishes the Islamic rule of Law and promotes basic human rights, Economic Domestic Justice including equality and better treatment of women. Prohibition of shedding innocent blood, and taking of wealth without right, which stresses Islam’s protection of souls. Nullification of validity of actions of Jahiliyyah or Pre-Islamic Era. Prohibition of taking Riba (usury and interest), which is an increase on the principal, whether small or large. Admonition to fulfill and give women their rights, and to deal with them in goodness. Seek guidance the Book of Allah, in which lies the honor of Muslims and their victory. Testimony of the Companions that the Messenger of Allah (S.A.W) conveyed the message and discharged his trust. 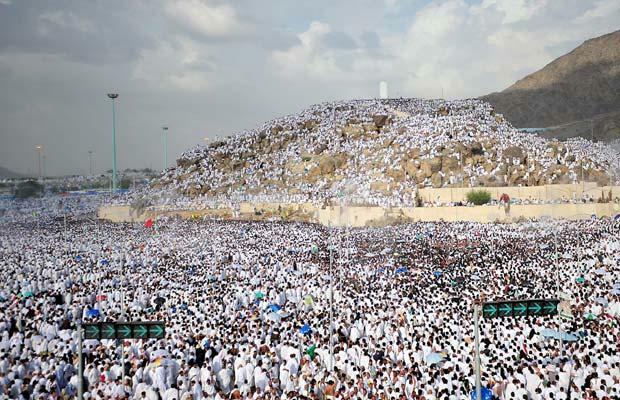 Order to take rituals of Hajj and other rituals from the Prophet’s sayings and actions. Subtle indication that the Prophet’s farewell would soon come. This sermon addresses some of the major religious issues faced by Muslims today and is a perfect summary of our religion. It should serve as a reminder to Muslims and a source of guidance for mankind. I pray that we benefit from these words and are able to implement even the smallest change in our lives to live in accordance with the basic fundamentals of Islam. This entry was posted in Reflections & Lessons, Uncategorized and tagged Allah, Arafat, Faith, God, Hadith, Hajj, Islam, Islamic Law, Koran, Monotheism, Muslim, Muslims, Pilgrimage, Prophet, Prophet Muhammad, Quran, Reflection, Religion, Sermon, Shariah, Sunnah. Bookmark the permalink.